The Mercury Newspaper in Pottstown, Pa., shares its experiences in and around our community. Following are the 12 Sweets of Christmas recipes to accompany our Pinterest board. These treats were submitted by readers, our TownSquare bloggers and Mercury staff. You can vote for your favorite sweet in our online poll below. The votes submitted by Dec. 18 will determine which sweet is featured on our Dec. 19 food page. 1. In a mini-chopper or blender, chop almonds with 1/4 cup flour until fine (should take less than 30 seconds; for a crunchier, nuttier cookie, chop for just 15 to 20 seconds). 2. In a medium bowl, combine nut mixture, remaining flour, butter, confectioners' sugar, zest, and egg. Mix well. 3. Divide dough in half; wrap in plastic. Chill for at least 1/2 hour. 5. Roll out dough halves on a floured surface. 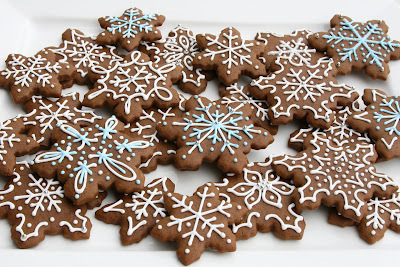 Using small round cookie cutters, cut out cookie bottoms and tops. With a patterned cutter (we use a snowflake shape), punch a center hole in tops. 6. Bake for 8 to 10 minutes or until light gold. Watch carefully. Cool on a wire rack. Spread a thin layer of jam on each bottom cookie; sandwich with tops, pressing gently. Dust with sifted confectioners' sugar. Recipe from the 1963 edition of the "Betty Crocker Cooky Book." Heat water in saucepan and stir in sugar and chopped up dates. Stir constantly until slightly thick then remove from heat. Cool. 1. Mix shortening and butter, sugar and egg. 2. Stir together flour and baking soda. Add to egg mixture slowly until thoroughly mixed. 3. Roll out into a rectangle. Spread the date filling on top and roll into a log about 2 1/2 inches in diameter. 5. Remove from fridge and cut into rounds. Place on ungreased baking sheets. 6. Bake 8-10 minutes until lightly browned. From Parade magazine's "Objects of our confection." 1. Melt 12 oz white chocolate in microwave, stirring often. Add shortening and remaining 4 oz chopped white chocolate. Stir. 2. Spread on a parchment-lined baking sheet; top with peppermint candies. When hardened, break into pieces. This recipe was submitted by reader Tina. It's is her favorite holiday cookie. 3. Stir in flour and salt. Add nuts and mix well. 5. Bake at 325 for 20 minutes. 6. Roll in powdered sugar. This recipe was submitted by reader Audra Ross who said, "This is my mom's recipe for Holiday Loaf. Banana bread with chocolate chips is a favorite any time of year. Add some chopped walnuts, ain't nothing wrong with that! And then the maraschino cherries add just the right sweetness and pop of color that make this bread a holiday treat that is perfect for dessert...or breakfast." Cream butter and sugar together (or substitute 1/2 cup unsweetened applesauce). Add the flour,baking soda and salt. Fold in the bananas. Stir in the chopped nuts, cherries and chocolate chips. Pour into a greased 9x5 loaf pan (or 2 mini loaf pans). Bake at 350 for 70-80 minutes until a toothpick comes out clean (40 minutes for mini loaf pans). Submitted by reader Lani Brezina Goins who says these treats are easy, yummy and pretty. 4 glass mugs or bowls. Make the instant pudding according to the directions on the box. Put six of the candy canes into a heavy food storage bag, and hit them with a hammer or meat mallet until crushed. Using a whisk, mix the mint syrup or extract into the whipped topping. Layer the brownie crumbles, whipped topping, crushed candies and pudding in the mugs. Finish with a layer of whipped topping, and sprinkle with a few of the crushed candies. Stick one of the unbroken candy canes into each mug. Submitted by TownSquare blogger Bob Garrett. Add ice cubes to glasses. Measure out about 1/2 cup Club Soda and pour into each glass. Measure out 3 TBSP Torani syrup. Add the syrup to the soda. Just before serving add the 1 TBSP of Half & Half to the soda/ syrup mixture. Serve with whipped cream and a cherry on top, as well as something to stir with prior to drinking. Encourage everyone to give it a little stir before drinking so that all the flavors meld. 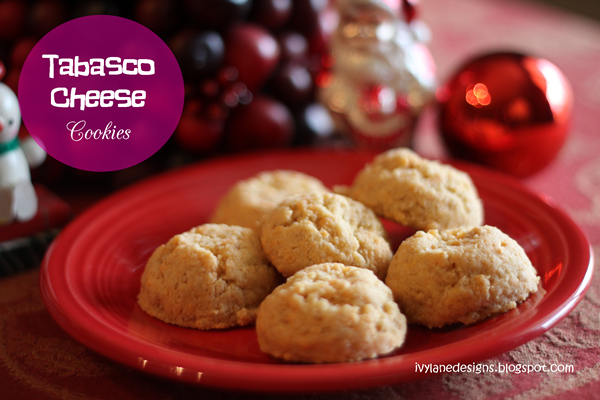 Submitted by TownSquare blogger Merrill of Ivy Lane Designs who says "My mom bakes Tabasco cheese cookies for me every Christmas. I hide them from everyone so that I don’t have to share. Sometimes I hide them too well and have to decide, months later, if I should still eat them. That is a sad moment." This version is vegan because her family recently changed their diet. Allow cheese and butter to come to room temperature. Combine and blend well. Mix in remaining ingredients until dough forms. Pinch off walnut-size pieces and roll into balls ... or use your handy dandy cookie scoop. Bake at 350 for 20 minutes for walnut-size, or 25 to 30 minutes if you use a cookie scoop. This recipe is from Sports Editor Steve Moore, who says his mom "used to make this for us on Christmas morning. Because all Jewish families get together to exchange gifts on Christmas morning, right? Oh, just me…"
Beat together all other ingredients. Grease and flour a tube pan (the round pan with ridges and the tube in center). Put in alternate layers of batter, apples and cinnamon mixture in that order. Let cool 10 minutes before inverting. A traditional German Christmas cookie. Carved molds or rolling pins are used to make these cookies and they are often elaborately decorated with icing, candies and food dye. This recipe is from Betty Crocker. Will need a rolling pin and rolling board or mat as well as Springerle molds or presses. 1. Beat eggs and sugar thoroughly. Stir in flour until a stiff dough is formed. 2. Refrigerate the dough for 3 to 4 hours. 3. Roll out the dough on a floured board (to prevent sticking) to about 1/8-inch thick. 4. Press stamp or Springerle rolling pin onto dough to emboss the designs. Cut out the squares. 5. Let dry on a floured board after sprinkling on anise seeds. 6. Bake on lightly greased cookie tray at 325 for 12-15 min. This recipe comes from Cooking Creation blogger Celeste who says these are a spin-off of her favorite Christmas cookie Raspberry Ribbons. Cream together the butter and sugar until smooth. Beat in the egg and vanilla. In a large bowl, sift the flour, baking powder and salt. Gradually add the flour mixture to the butter mixture. Roll out the dough into 1/4-inch thickness. Using a cookie cutter, cut out the candy cane shapes. Gather the scraps and roll the dough out into 1/4-inch thickness. 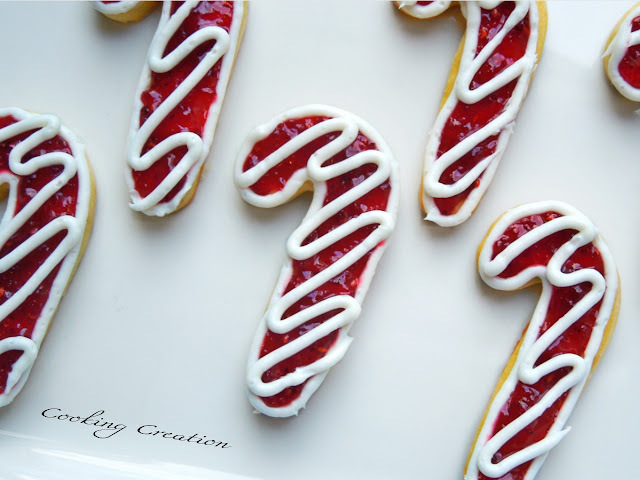 Cut out more candy cane shapes with the cookies cutter. Place the cookies on lightly greased baking sheets. Bake for 12 to 17 minutes, or until the bottom edges just begin to brown. Remove the cookies from the oven and allow them to cool on the baking sheets for 5 minutes. Transfer the cookies to a work surface for decorating. Pipe the outline of each cookie with white icing. Carefully spread approximately 1/2 to 1 teaspoon of the raspberry preserves in the center of each cookie using a spoon. This works best when the cookies are still slightly warm. Pipe zigzag lines on top of the preserves with more white icing. Mix shortening sugar and molasses. Blend all dry ingredients together. Stir into sugar mixture. Place in fridge to chill. Roll dough out 1/4 inch thick on a floured board. Use your favorite cutter. You can make traditional gingerbread men with this recipe. Cook on lightly greased cookie sheet, keeping them far enough apart so they don't bake together when they spread. Bake 10-12 minutes at 350.